Are you tired of chilly floors in the winter? Is your basement too cold or too moist at certain times of the year? Is it costing you too much money to heat your home in the winter? Do you have a crawl space that’s damp, dirty and moldy? Installing the right kind of insulation can solve these problems. Here at Southeast Foundation & Crawl Space Repair, we offer a variety of options for insulating your foundation. All of the insulation products we install are designed to withstand water and moisture and provide you with greater comfort from the ground up. Many homes have basement insulation in the form of fiberglass batts that are installed between basement ceiling joists. Unfortunately, this treatment only insulates the floor above; it does nothing to make your basement more comfortable and energy efficient. Insulating & finishing made simple. Basement to Beautiful panels provide basement wall insulation and waterproof steel framing in a single step. 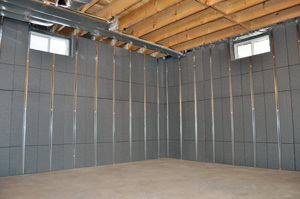 For basement insulation that makes your basement for comfortable and your entire home more energy efficient, you can’t beat the performance and value of our Basement to Beautiful® wall panels. These innovative panels combine high-performance SilverGlo® rigid foam insulation and steel nailing flanges that make it easy to install finished wallboard. Unlike fiberglass insulation and wood-framed basement walls, SilverGlo™ wall panels can’t be damaged by moisture; nor will they compress, lose R-value or provide nesting space for mice and other pests. Wiring channels have been incorporated into each panel to make it easy to install wall outlets, switches and lights. Protection & insulation in one step. 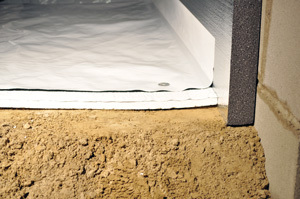 For basement floor insulation that includes waterproof floor underlayment, choose ThermalDry® Insulated Floor Decking™. 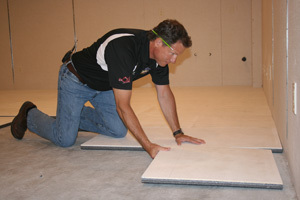 Do you want to install a finished floor in your basement? If so, talk to your Basement Systems contractor about ThermalDry® Insulated Floor Decking. By combining rigid foam floor insulation with a waterproof composite panel, ThermalDry® floor decking enables your installer to install floor insulation and sheathing in a single step. Say goodbye to cold, clammy basement floors when you choose ThermalDry® floor panels. Installing ThermalDry® Insulated Floor Decking™ is the perfect preparation for the finished floor of your choice. Southeast Foundation & Crawl Space Repair can help you start from the ground up to improve your home. By creating a dry, comfortable space below your home, you can improve the condition of your living space above. We provide waterproofing and insulation services to customers in Wilmington, Fayetteville, Greenville and many areas of North Carolina.